If anyone told you that Facebook CEO -Mark Zuckerberg- which is also the owner of Whatsapp Messenger has been ha^cked, would you believe?, Mark Zuckerberg was very shocked today that his account has been tampered with, which are his Twitter, LinkedIn and Pinterest online accounts, which were hac^ked through his weak and able to guess password. Mark says he hardly use those accounts and people are also wondering that a whole Mark the owner of the biggest online social media website uses a weak password. Not only that, but he used it in 3 of his online social media accounts. I will say he was lucky he didn't use the same weak password in his Facebook account. Who knows what would have happened. Do You Want To Know What Password He Used? 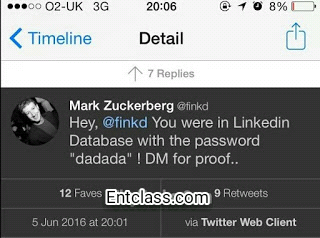 You can imagine that a whole Mark Zuckerberg used just dadada as his password in 3 of his online social media accounts. No case sensitive and no special characters. This is really a f^^k up. All i can say to you guys is to use a very strict password that consist of upper and lower case letters, symbols and numbers all together. With these kind of passwords, i wonder the kind of native doctor that can easily guess the password. And also, never use a password in 2 different accounts, cos its never safe. Try to use a password you can easily remember and never use names of any members of your family or even your name as your password. All i will say is, Play safe guys. Always visit us here on Entclass.com for more updates and free browsing tweaks. And don't forget to download our Android app on Google playstore, so that you can be notified of our new posts easily. This is kinda serious. Not surprise anyway.